There was something wrong. Ten years ago this morning, my nine-month pregnant self and husband, Dave, were peacefully pacing our neighborhood, in spite of our fear. My pregnancy had been uneventful if you don’t count, constant “morning” sickness for the first four months, weight gain so great you stop looking at the scale, and being crazy old according to clinical wisdom. But birthing has been eventful for me three out of four times, to include this birth. When my water broke early that morning and contractions didn’t begin, from past experience I knew something was wrong. I called my midwife, Mary, who came to our home right away. She told us a litany of possible problems from benign to serious. Serious is frightening even when it hasn’t been realized. Together we drew up a plan and timeline for how long we would labor at home and at what point we would transfer to the hospital, if needed. Our three children slept, awoke, ate breakfast, did chores, brought me water, played, applied pressure to my back, and took turns pacing with me. 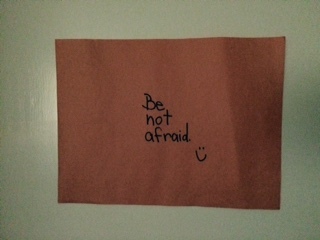 When I retreated to my bedroom closer to the time of birth, I posted this construction paper wisdom on my door for my children. Be not afraid 🙂 . Thirteen-year-old daughter, Devin, made what would be the most delicious chocolate cake of my life. I could smell the cake cooking and hear my children laughing as I stared down my fear. My husband’s strong arms gave me strength. The rest is a blur, as it usually is, but what isn’t a blur is this. I held John Paul in my arms and all was well. The problem was his positioning, which needed time and care to finesse his entry. Time and care not impeded by fear. John Paul’s entry into the world was extraordinarily ordinary. It was as if he had been with our family all along. Within minutes of his birth he was greeted by his siblings as if they were all old friends. My husband, for the fourth time in our marriage, beamed his happiest smile, one of fatherly pride and husband relief. As for me, shortly I would be sitting on my couch, nursing my sweet baby, watching Lord of the Rings, and eating chocolate cake in an extraordinarily happy state. Fast forward to now. The “Be not afraid 🙂 ” reminder still hangs on my door. John Paul is still sleeping. I’m struggling to enjoy this fleeting and bittersweet moment. He’ll awake soon and the birthday festivities will begin. Tonight, as every night, the last thing that John Paul will tell me is, “I love you more than the world.” Son, I love you more than the world, the moon, the stars, and the infinite love beyond. Thank you for your love, for forging my bravery, and for making the world a better place, Little Man. What events have challenged you to stare down fear? What were you doing ten years ago? What are your favorite birthing or birthday memories? 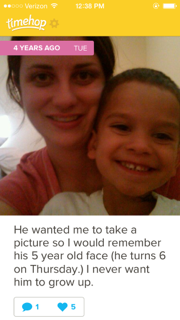 This entry was posted in Brave, Character, Family, Grow, Happiness, Relationships, Solo and tagged Birth, Birthday, Celebrate, Family, Love, Pregnancy. Bookmark the permalink. Thank you, Michelle ❤ I’m still working on being a loving mother, a loving person. Life can still be scary for me, but love is bigger…love heals. Crying. That was such a beautiful day. Not a farmer, and apparently, not very tech-savvy ! Hugs to you, Angie. Enjoy the moment ! Very cool that he had a birthday cake on the actual day of his birth. Happy birthday to him. Do! And Keisha, grab yourself a blog award https://familylovedoesmore.com/2015/05/06/blog-awards/ I’ll get to your non-WordPress blog soon! Beautiful! Thanks for sharing your heart warming story. Angie, this brought tears. I’ve never heard of a birth like this. I love that the rest of the family was around, going about their lives. The cake!! And your sign – I am so impressed that in *your* moment you had the thoughtfulness and wherewithal to be looking out for the feelings of the other kids. Wow. Do people really live like this?! (that is rhetorical!). 10 is a *great* age. Aww, thank you back! And for your generosity in saying my opinion matters. I am cheered and encouraged once again by the sheer purposefulness by which you (and Dave, yes?) chose to raise and live with your family. I don’t doubt you – you have credit in my bank too – but I continue to be taken aback (in a good way). Picturing this birth leaves me a little saucer-eyed. Saucer-eyed is a great way to describe how I go through life, LOL! The cool thing about really working this family thing hard is that the principles of healthy relationships work across the board. Kindness, respect, generosity, boundaries, all that good stuff. But it definitely takes time to learn these habits of attitude and behavior. Something new to learn every day. Wow, this is wonderful, Angie. What’s that saying — Courage isn’t the absence of fear, it’s the mastery of it? (Something like that). I’m so happy everything turned out well, that day and since! The title of your blog says it all! Courage as the mastery of fear, oh Jim, goodness knows I get plenty of opportunities to practice mastery of fear! Thank you for your high compliment. I’m just so happy that you can connect my blog title with me and what I’m trying to do here 😀 Hope your weekend is terrific!